Season Two Summary: After defeating Kale and returning the Crown Jewel to the Jewel Box, the Jewel Riders discover that having the Crown Jewels tuned to the Enchanted Jewels has given them greater powers and new Jewel Armor. Meanwhile, Kale meets the Wizard Morgana in the Wild Magic and the two hatch a plan to collect Wizard Jewels in order to gain enough magic to rule Avalon and the Wild Magic! It’s a race between the Jewel Riders, Kale and Morgana to collect the Wizard Jewels and determine who will control their magic! To read the scripts from Season Two, visit our Season Two Scripts page! Morgana the Sorceress finds her Dark Stone, but realizes that she can’t control it because it has been tuned to Kale. Morgana makes a deal with Kale to work with her against the Jewel Riders. The Sorceress wants Kale to retrieve very powerful Jewels called Wizard Jewels. The Jewel Riders learn about the newly enhanced magic of their Enchanted Jewels and of a new quest to retrieve the special Wizard Jewels that can give Merlin back his magical powers and return him home. Using maps found in Merlin’s cottage, The Jewel Riders begin to map the Wild Magic looking for powerful Wizard Jewels. Tamara finds a place that registers strong magic from her Heart Stone and the Jewel Riders head there with the help of the Wild Magic Gliders. But Morgana has set a trap that sent Gwen, Sunstar, Fallon, Moondance and Archie to a place where Morgana can steal the magic of their Enchanted Jewels. Tamara is sent to another place in the Wild Magic where she makes friends with a magical zebracorn, named Shadowsong. Tamara and Shadowsong form a strong bond and must go to the rescue of the other Jewel Riders before Morgana can steal their magic. It’s high fashion and high-jinx as the annual charity fashion show opens at the Crystal Palace fair grounds. In addition, it’s Queen Anya’s birthday and King Jared wants to surprise her with a new dress. When he assigns Gwen and Sunstar to handle the “secret mission”, the Princess manages to get Fallon, Moondance, Tamara and Tamara’s baby animals involved in a comedy of errors as each girl and animal tries their best to complete the mission. Meanwhile Kale sneaks into the show with a strange spinning wheel that makes a dress too magical for Gwen to resist. When Gwen puts the dress on, she falls under an enchantment spell, and must obey Kale and Morgana. The Jewel Riders must break the spell before Gwen leads Morgana and Kale into the Jewel Keep, where the magical jewels are kept. In the magical gardens of Gardenia, a gardener/gnome fools the Jewel Riders into thinking that he is one of the great Wizards from Avalon’s past, and capable of great magic. The gnome has the ability to sculpt magical topiary animals that transform into crystal creatures. When the Jewel Riders discover that the gnome is not what he appears to be (actually a Wizard’s Apprentice), they convince the little fellow to help them retrieve a powerful Wizard Jewel from a dangerous place called the Sorcerer’s Playground before Kale and Morgana can get it. The unicorns, the most magical animals in Avalon, are in danger. The Queen of the unicorns is missing and a successor must take her place. The leadership must fall upon one of her relatives. Moondance, daughter of the Queen, must go to the magical place and preform a series of tests to determine whether she should become the new Queen of the unicorns. This would mean no longer being a Jewel Rider and leaving Fallon. The Jewel Riders journey to the enchanted lands of the unicorns to learn about the mysterious secret of their magic. Moondance must choose where her loyalties lie, becoming the new Queen of the unicorns or staying with her best friend, Fallon. While searching for wondrous Faery Wraiths in the Forest of Arden, Princess Gwenevere finds romance and magic with a strange boy named Ian. Hearing Gwen’s cry for help, Ian rescues the Princess out of a marsh mire. However, the young man doesn’t reveal to the Princess the wondrous magic jewel he has recently found. The jewel has enabled him to transform from a beast to a human boy. Now that he has met Gwen, he is worried that if he gives the jewel away, he may remain a beast forever and lose Gwenevere’s love. He must decide what to do because Kale and Morgana have offered him the chance to become human forever, if he gives them the magic jewel. When Ian sacrifices the jewel to save Gwen, she convinces the beast/boy that no matter what shape he takes, she will always be his friend. Gwen and Drake get lost in the misty walls that surround Avalon and discover a new magical but dangerous place outside the borders of the kingdom. Lost, they must work together to unravel a riddle told to them by the magic trees that live in this secret place. Gwen and Drake must search for a magic Wishing Jewel that will turn this land to goodness and extend the borders of Avalon before the wild magic causes this place to vanish completely. Princess Gwenevere, Sunstar, and the Jewel Riders embark on a great sea voyage to a magical island where a Wizard Jewel has landed. Sailing over the great Sea of Avalon, the Jewel Riders get caught in a wild magic water ride and discover an underwater kingdom of Mer-creatures. When Cleo falls overboard, she is rescued by a merboy and transformed into a sea unicorn. The merboy trades his mer-jewel with Tamara’s Heart Stone. He becomes human, but Tamara is transformed into a mermaid. The other Jewel Riders must find the merboy who has run off to the magic island and convince him to give the Heart Stone back to Tamara. Meanwhile in the undersea gardens, Tamara confronts a big sea dragon and realizes why the boy ran away. Can the Jewel Riders find the magic to transform Tamara back? Three mischievous trolls find new Enchanted Jewels in the Wild Magic and use them to steal all of the Elf Magic from the Elf Woods. The Jewel Riders ride into town and look for a show down with the Trolls to save the Elves. The Wild Magic Gliders tell the Jewel Riders a creature is crying from somewhere in the Wild Magic. Tamara convinces the Jewel Riders to go and rescue the creature. The Jewel Riders ride into the Wild Magic and discover a “lost island.” But Kale and Morgana have also found this island and are looking for magical Wizard Jewels. The Jewel Riders find a giant creature who, amazingly, only responds to the baby animals. It’s up to Cleo, Sugar and Spike to save the day and rescue the giant baby creature from Kale. A fortune teller and her mysterious cat are using a magic jewel to tell people’s fortunes. When the Jewel Riders have their fortunes read, a dark future is revealed to Gwenevere that tells of the fall of the Crystal Palace and the rise of Morgana to rule Avalon. Gwen and her friends must get this magic jewel to the Jewel Keep and out of Morgana’s hands. The Jewel Riders must travel to the Heart of Avalon to prevent the prophecy of the Fortune Jewel from coming true. In the Heart, Princess Gwenevere and Sunstar travel across a magical lake where she meets the Spirit of Avalon. Gwen is given the magic Staff of Avalon by the Spirit. The Spirit of Avalon instructs Gwen to take the Wizard Jewels already collected and the new Staff and journey to the center of the Wild Magic. There she will forge the jewels together and create a new magical jewel for Merlin to place upon the Staff. But Morgana steals the Wizard Jewels and heads to the center of the Wild Magic first. 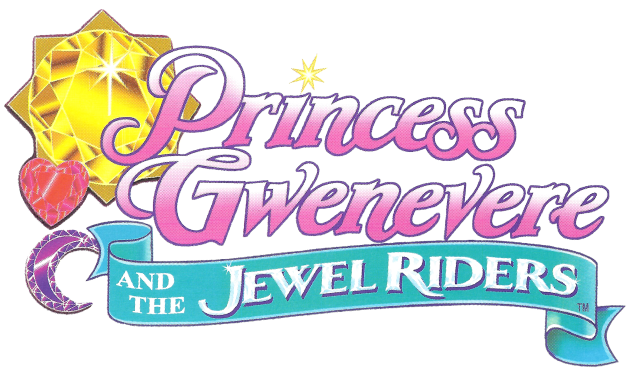 Princess Gwenevere and the Jewel Riders journey to the center of the Wild Magic where they confront Morgana for the control of the magic of Avalon. Morgana is trying to forge the Wizard Jewels together and make one magic jewel that will control all of the Wild Magic. The final showdown begins as the Jewel Riders battle against Morgana in a series of magical events to determine the future of Avalon and the fate of Merlin.